As April 15 approaches, some of us experience a short-lived obsession with, and resentment of, taxes. 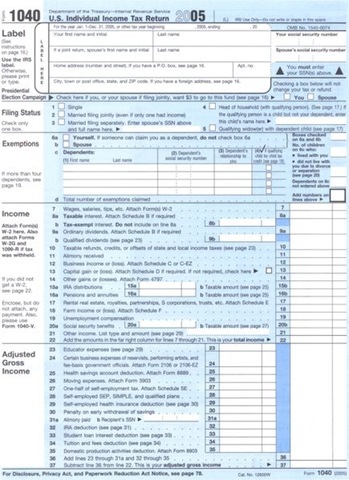 For fairly obvious reasons, those of us who put off sending in the old 1040 until the last minute tend to be those who need to accompany our returns with checks made out to the Treasury. Folks entitled to checks going the other way tended to file weeks ago. Having to fill out lengthy government forms is bad enough. Capping off the process with a savingsectomy is enough to turn anybody into a grumpy Republican. For me, this is like being an Irishman on St. Patrick’s Day. I enjoy the company of my temporary compatriots, even though I know it won’t last long. Pandering to this grumbling constituency this week was The Big Money, which shared a list of the five worst parts of the tax code. The fact that they could come up with only five tells me they are only seasonally grumpy. A year-round resident would have come up with at least ten. Without further ado, here are their five nominees and my comments. Ethanol Credits: I don’t think of this as a tax code issue so much as just really bad government policy, but that policy is enacted mostly via tax breaks, so I guess it’s fair game. And it is truly bad policy, making nobody happy other than the farmers who benefit from what is essentially another agriculture subsidy. Even most global warmists don’t think it helps save the planet and it has the unforgivable side effect of making food more expensive. Stepped Up Basis: A person who inherits an asset, shares of stock or a farm, for example, and who then sells that asset will pay capital gains tax on the difference between what they sold it for and what it was worth the day they inherited it, not what it was originally purchased for. So if Old Uncle George bought a hundred shares of XYZ Co. in 1950 for $100, and left it to you when it was worth $1M, the gain between $100 and $1M never gets taxed. I guess I agree this doesn’t make a whole lot of sense, but I would have a hard time putting it in the top 5. It often comes up in discussions of estate taxes. If we ever abolish the estate tax (I’m in favor but not holding my breath) doing away with stepped up basis would make sense too. Mortgage-Interest Deduction: Right on, dude. I wrote about this just the other day. Exemption for Employer-Provided Health Insurance: Just about everything your employer gives you is considered a taxable part of your compensation. Exceptions include 401k contributions, uniforms, and healthcare. Dropping it was discussed during the Great Healthcare Debate, but it didn’t get far. Partly this was due to the objections of employees, particularly unionized ones, who didn’t want to pay more in taxes. But what really sank it was that it was suggested by McCain in the 2008 election. Municipal Bond Interest Exclusion: Interest paid on munis isn’t taxed by the Feds. I guess I would prefer not to subsidize states and municipalities to borrow money, but other than that I really do not see a problem here. The author of the Big Money piece seems to believe that the subsidy bit is okay, but that the US government could do a more efficient job of funneling money to states and cities. Her view is that owners of muni bonds are getting too good a deal and are receiving much of the subsidy. That does not make logical or economic sense. The market for munis is reasonably competitive. Issuers do what they can to pay as little as possible in interest. Buyers pay what they do for the bonds based on balancing the risk with the after-tax reward. If interest on the bonds became taxable it seems pretty obvious to me that the rates would rise to the point that bond owners got the same after-tax return as before. The money “lost” to the federal government in not taxing munis is exactly the same money “saved” by the issuers of munis in lower interest costs. How could it not be? I think it would be cleaner to have the federal government simply directly subsidize local borrowing, for example by just picking up the tab for some percentage of the interest paid, but I don’t think it would save any money. All in all, I am a little disappointed at this list. It’s a good try for a part-time grump, but we full-time curmudgeons can name a few problems in the tax code that are at least as bad as muni bonds and stepped up basis. The AMT comes immediately to mind. Differing tax treatment for married and single people is another obvious, if controversial, example. The long list of things that are not indexed to inflation, including most especially the basis for calculating long-term capital gains, always raises my ire. And then there is possibly the most obvious of all, the sheer soul-crushing complexity of the tax code itself. Can there be a better example of government caused waste than the billions of hours spent by Americans complying with the tax rules? Still, I’m glad for the cynical company, if only for a few days. Re the stepped-up tax basis: don’t you have an estate tax in the US? If so, that asset was taxed already at the time of the inheritance. No problem there. Re the muni exclusion: the real trouble is that it disproportionately helps people in the highest tax brackets. As you say, arbitrage will cause the interest rates to drop to the point that the benefit breaks even for the capital invested in munis. The trouble is, most of the capital comes from the highest tax bracket, so that defines the break-even rate. Those in lower tax brackets are worse off with munis. Your scheme of directly supporting municipal borrowing would help everyone equally. My beef is that the IRS estimates that it costs $338 billion just to comply with the 80,000 freakin’ pages of tax code. That’s over $1100 bucks for everyone in the US. Further, an estimated 7.6 billion hours are spent trying to figure the whole mess out. All to send hundreds (even thousands) of billions of dollars to a group who spends like drunken sailors with a stolen credit card. @ Patrick – There has historically been a fairly large amount that could be excluded from estate tax. In 2009, this was $3.5 million. At this exact point in time, there is not currently an estate tax … but congress will certainly rectify this will year end and make it retroactive to January 1. My mom was the beficiary of the stepped up basis. She and dad were selling the farm (160 acres purchased in 1970 and sold 30 years later). Dad got lung cancer and died before the sale was final (the sale wasn’t delayed or anything – the end just came really quickly). Mom had a capital gain on “her” half of the farm, but not on Dad’s half, since it was sold very shortly after she inherited it and the basis was stepped up to FMV (and, of course, the farm was then sold at FMV). Kind of strange … if Dad had lived a bit longer, there would have been a much larger tax bite. I think the step up is there not for the purpose of helping people out, but helping out the IRS. Imagine trying to figure out the basis on someone who held Ma Bell from the beginning. They would inevitably make up a number that the IRS would have to spend man hours trying to refute. It is just easier for everyone involved (including the IRS and the judiciary). Also if I remember correctly the Muni Bond thing has to do with constitutionality. See Pollock v. Farmers’ Loan & Trust Co. & South Carolina v. Baker (which limits Farmers). How can the child tax credit not make the list? It’s not like we need policies that encourage people to have more kids; rather the reverse, really. At an absolute minimum, it should be means-tested so that the poor and childless aren’t subsidizing the middle-class/rich and fruitful. Evan, I don’t think step up is about easy. Not much of IRS code is about being easy. I don’t think the IRS spends much time trying to prove or refute cost basis figures. They just require you to substantiate your figures if audited. Its cause they don’t have to right now. Let them try and figure out what deceased Grandma Bought that house for in the 30s and then what capital improvements she did to it. Or how much Grand Pa paid for Ma Bell before it was spun off 17 times with dividend reinvestments. I really believe that Step up was created to save some legal fees fighting over basis. Patrick: I’m not really sure it does help the high tax bracket folks. I think the non-exempt muni interest would have to carry a higher rate such that it was a wash on an after-tax basis. Obviously, borrowing money means paying rich people interest either way. Ron: I almost used those figures about the size of the tax burden in the post until I thought about them a little more closely. 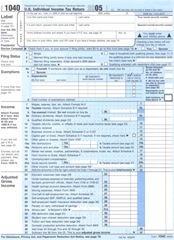 7.6 billion hours is 55 hours per tax return, on average. I spent maybe 5 hours on mine, and my return has got to be more complex than average. (E.g., I have foreign tax carryforwards.) Then $338B divided by 7.6B is $44.47 an hour which seems a little steep as average wages go. Kosmo: Your story about your parents is a perfect illustration of what a mess the whole thing really is. It’s not that it’s subsidizing something good or bad, it’s that it’s basically random in effect. I bet in real (inflation adjusted) terms the gain on the farm wasn’t all that much anyway. Evan: Stepped-up basis sure makes bookkeeping easier, but as Jim points out, not much of the IRS code is about easy, so why this? And figuring out your basis on something you’ve owned for a long time isn’t much easier than figuring out the basis for something your dad bought. Trust me. I’m old. On a related note: Never purchase one share of stock for a child. It’s a cute idea, but will cause them a royal headache thirty years later when they sell it and need to find the basis. Neil: I think I like the Canadian system. Of course, it would be shot down here by those damn farmers again, who wouldn’t want to have to sell some of the “family” farm to pay the taxes. I’ll vote for the AMT as one of the worst items in the code. Think you understand what your taxes should be and then get AMTed with a big bill that is due. Not sure if others agree, but I have a belief that the lack of indexing of the AMT limits is a perverse way of our government phasing us all to an alternate tax system. @ Ron Does the figure about tax compliance costs include corporate taxes? If so then the numbers actually would be less than I expected. I don’t even want to think about how much effort goes into the taxes for, say, Exxon or Bank of America. And for that matter, think of all the entities that don’t pay taxes but still have to do tax compliance. University endowments come to mind, since they have to prove that they are following all the proper IRS procedures, and they must avoid generating UBTI, among other things. @ Evan The Ma Bell example is a good one. There is actually a software company that sells, for $79, a program that can compute the cost basis for pre-breakup shares of AT & T with reinvested dividends. The writers estimate that doing the computations by hand would take several weeks solid. The existence of something like that is a strong argument both that the tax code is screwed up and that stepped-up basis is a very good idea. If you can’t substantiate the basis for a stock you bought, the IRS sets the basis at … zero. YOU have to prove the basis, not them. If you can’t, you’re SOL. So the IRS gains nothing through the stepped up basis. The raw ROI was somewhere between 5.75 and 6 percent. Not bad, considering that it was an asset that was required for the operation of the business. OMG! I forgot UBTI! That’s a part of the code that isn’t just stupid, it costs American jobs by forcing endowments to go overseas. It isn’t like you, the tax payer, throws up your hands and goes the tax man said my basis is zero. It goes to litigation, and litigation costs lots and lots of money (yes for you the tax payer) but also for the gov’t between IRS agents/attorneys and judges. If you DO have some documentation of basis, then the whole argument about the IRS is moot. Regardless, I think the tax revenue lost by the IRS via stepped up basis is going to offset the litigation costs. In the example of my parents, the stepped up basis cost the government tens of thousands of dollars in tax revenue.